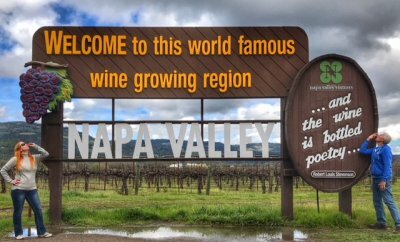 If you are tasting wines all along the road, as we are doing as part of this road trip, then a stop in Napa and Sonoma is truly a must. That said, after stopping at one Napa winery that held fond memories for both of us and finding that the tastings cost anywhere from $40 to $70 PER person, we spent the rest of our days in the lovelier, friendlier, and cheaper Sonoma Valley. Perhaps our favorite all-around wine-tasting occurred at Alexander Valley Vineyards, located in Healdsburg. Like Benzinger, this winery also believes in sustainability and smart growing practices. Their vineyards are part of the California Sustainable Winegrowing Program, receiving certification in 2014. We not only bought some lovely wines from this winery, but also farm-fresh eggs. 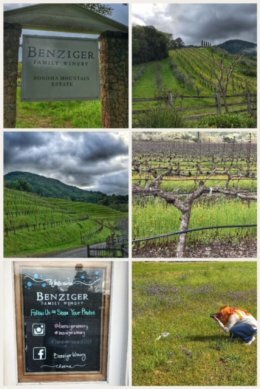 The customer service was absolutely wonderful… and amazingly in this the Napa/Sonoma area, one of the only wineries in which the regular tasting is free. (Most wineries charge for any tasting, with estate/premium wine-tastings at a premium price.) Definitely add Alexander Valley Vineyards to your tasting list! 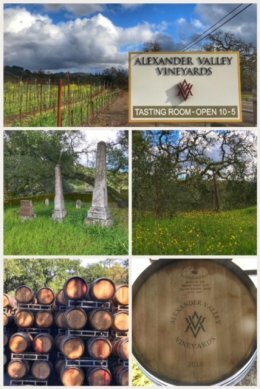 While out and about in Sonoma Valley, we discovered that the timing of our visit coincided with Savor Sonoma Valley — a weekend of barrel tasting in wineries in Kenwood and Glen Ellen organized by the Heart of Sonoma Valley Winery Association — and we knew we simply had to attend. 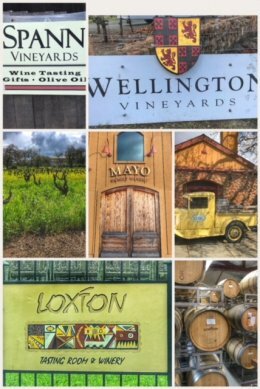 We started the journey in Glen Ellen at Loxton Cellars (very friendly folks), moved on to Wellington Cellars (where we had to buy an advance case of blueberry-jammy Estate Malbec). We then traveled to Mayo Family Winery, which had lost a house in the wildfires, but was saved from other damage. We loved meeting Heather and tasting their wonderfully delicious Zinfandel port, but we completely fell in love with their jammy, fruit-forward 2013 Laurel Hill Zinfandel — and we bought a case to enjoy on the rest of our travels. Of all the Zins we have had, this Zin was way above and beyond the others; if you love Zins, visit Mayo Family Winery. We concluded the event with tastings at St. Anne’s Crossing Winery and Spann Vineyards in Kenwood; both were fine and produce very nice wines, but an obnoxious bridal party at St. Anne’s Crossing ruined the barrel tasting for us. If you are a wine drinker, then visiting Napa and Sonoma are a must… but even more so after the devastating wildfires because so much of the area is driven by tourism. It was heartbreaking to see evidence of burned out communities and burned forests and mountainsides, as well as hear the harrowing stories of the people we met while visiting. 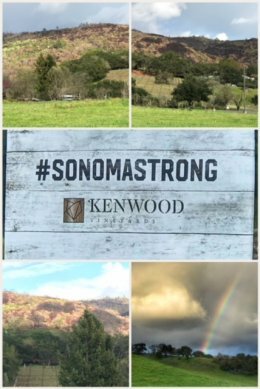 But the people are resilient, and #SonomaStrong is pervasive… as wine enthusiasts and nature lovers, we loved this adventure. As supporters of first-responders (Ran was a volunteer firefighter in Eastern Washington), we empathize with both the fire victims and the heroism of the many who battled these wildfires. 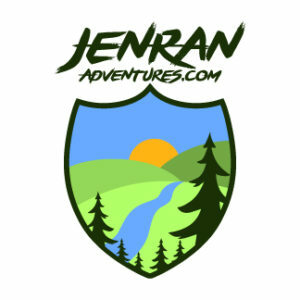 Visiting this key winemaking region, staying at one of the many lodges, spas, or hotels (or RV parks), and eating at one of the many amazing restaurants all helps the area get back on its feet — and helps with the rebuilding process.